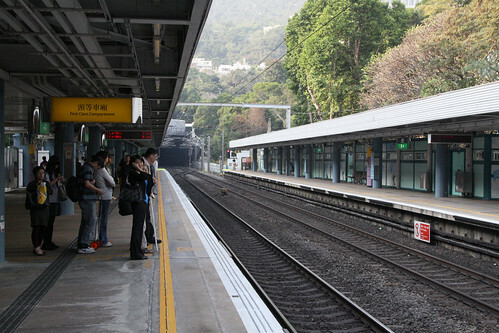 First Class travel by train can be found all over the world, but the MTR East Rail line in Hong Kong is one of the more interesting examples. Why? On a bad day you will be lucky to squeeze aboard wherever you can fit. The exception is the first class carriage: here there is no need for straphanging, with an abundance of comfortable padded seats with armrests, wide aisleways with a spacious two-plus-two seating layout, and a vestibule door shutting off the passengers back in “steerage”. With the wide aisle two-plus-three seating could have been installed to squeeze in a few more passengers – but instead the carriage carries just 72 seated passengers, with no handholds along the ceiling for standing passengers. Apart from the interior, the first class carriages differ in a number of other ways from the rest of the train. The most noticeable is the lack of doors: instead of the usual 5 doors per side there are only two. The centre door is the one normally used by passengers, with the offset door at one end provided as an emergency exit. The livery also differs, with a yellow stripe above the window line identifying the carriage to passengers. 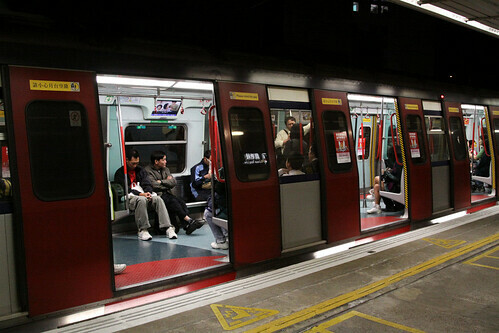 The first class carriage is always located in the same position in the train: car 9 from the Hung Hom end. The stopping location is marked by signage on each platform, making it easy for intending first class passengers to board – walking the length of a 12 car long train might take a while! Fares for travelling in first class are set at twice a standard fare, with payment being collected in two ways. 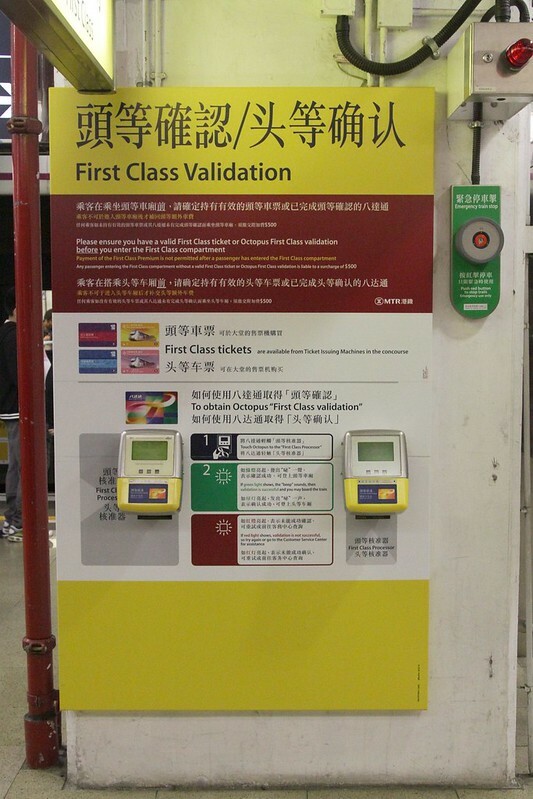 The first is with a “single journey ticket” issued by ticket machines outside the station: these are the same system of tickets used across the rest of the MTR network, except for the “First Class” printed on the front. The second is by validating an Octopus card on one of the First Class Processors, which results in the correct fare being deducted on leaving the system. 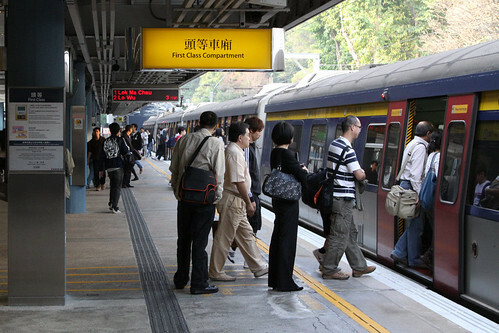 The fare processors are located on each platform beside the first class carriage stopping point, with passengers needing to validate their Octopus card before boarding the train. 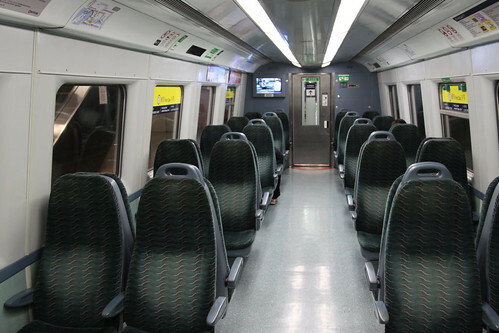 To prevent any fare dodging tactics, fare adjustments are not available inside the first class carriage itself, and the inter-carriage doors between standard and first class are locked. 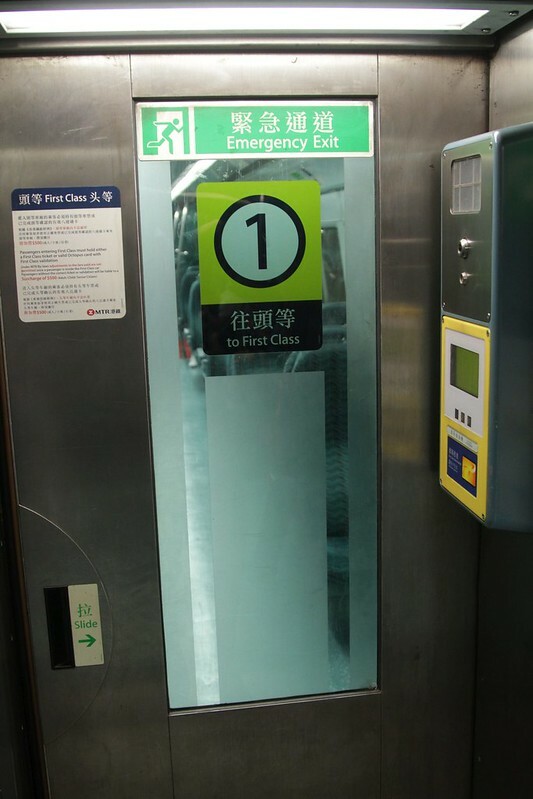 Additional fare processors are located on the standard class side of the doorway, allowing intending first class passengers to walk through the train and pay the correct fare. 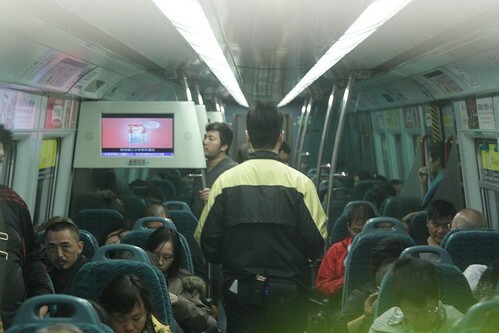 Enforcement of the fare system is carried out by ticket inspectors. Passengers travelling First Class without a valid First Class Single Journey Ticket or First Class validation on their Octopus cards will be liable to a surcharge of HK$500. For comparison the most expensive one-way first class journey costs HK$66. Despite the price, even at off peak times there is will be a queue of intending passengers at the first class carriage stopping mark. It seems kind of perverse: letting an empty train depart just because you can’t get a seat, but then again, the point of paying for first class on the MTR is the seat! This entry was posted in Transport and tagged East Rail, first class, Hong Kong, KCR, Kowloon Canton Railway, Mass Transit Railway, MTR, railway, trains. Bookmark the permalink. 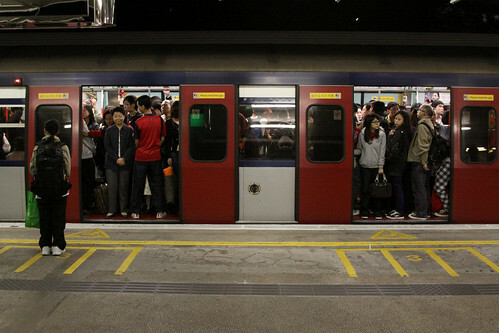 I must suggest that another possible reason why the passengers you observed did not board the train was because they wanted to board the train to Lo Wu in 3 minutes and not the train on the platform going to Lok Ma Chau. They are probably waiting in line even though the train that is at the platform isn’t the one they want because they want first choice of seats when the train they want arrives. Now that you mention it, waiting on the platform for a train to the “other” terminus is a perfectly logical thing for someone to do – I never needed to travel to the end of the line, so I didn’t even consider that as a reason.